Deaths Door Gin is a popular Craft Gin available from Amazon.co.uk in 70cl to buy online. Visit Amazon.co.uk for the best price for 70cl of Deaths Door Gin or compare prices on our other Craft Gin products. 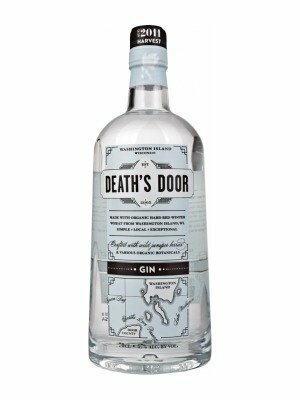 Death's Door Gin has a surprisingly simple botanical mix of organic juniper berries, coriander and fennel. Using juniper berries that grow wild on Washington Island with coriander and fennel sourced from within the state, Death's Door Spirits is able to showcase how complimentary and complex simple expressions can be. Death's Door Gin employs a 60:40 mix of organic Washington Island wheat and organic malted barley from Chilton, Wisconsin. Death's Door Gin has a full London Dry flavour without all of the bitterness because of the distillation process and the grains that are used. In fact, you can taste all three botanicals: loaded juniper berries up front; spicy, citrusy notes from the coriander seeds in the mid-palate; and a soft, cooling finish provided by the fennel seeds. Death's Door Gin is big enough to stand up to classic or vintage cocktail treatment, but soft enough to be enjoyed on the rocks or as a dry martini. It truly is the utility gin of our time. Where to buy Deaths Door Gin ? Deaths Door Gin Supermarkets & Stockists. You can buy Deaths Door Gin online in most retailers and find it in the Craft Gin aisle in supermarkets but we found the best deals online for Deaths Door Gin in Amazon.co.uk, DrinkSupermarket.com, TheDrinkShop, and others. Compare the current price of Deaths Door Gin in 70cl size in the table of offers below. Simply click on the button to order Deaths Door Gin online now.